Guess what? PLUS Blog Candy! Hello people! Well some of you already know..the news is that I am now a proud member of the Design Team for Stampingscrapping.com at Magnolia Stamps Lovers!! YAY! Yeap! 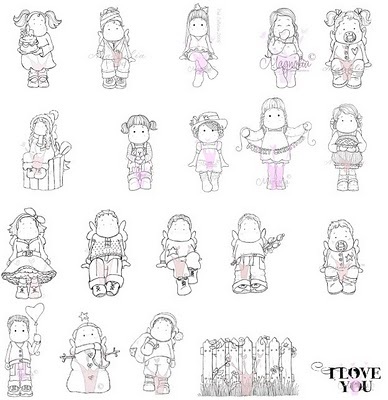 You will see me and other talented ladies coloring the adorable Magnolia and related stamps! My team mates are fantastic gals...so fantastic that we will be having a load of fun at Magnoliastampslovers Blog..come and join. But wait there is more! Vivi my little friend from Brazil and also a proud member of MSL is offering candy! 100 magnolia images for you!!!! Hop to her blog Handmad by Vivi and follow the rules..It is simple. Don't pass the opportunity! See you there! Good Luck! After that hop to Stampingscrapping.com, Cindy (the stamp fairy) has a ton of magnolia stamps in pre-order...Don't wait! You blink Easter and Spring will be here...why not get some brand new stamps for your projects! It is time for most of us start the count down... 4...3...2...1..It is almost 2010..Can you believe it? Men I am getting old by the second....tks tks tks. To celebrate the occasion in style I created this card inspired by the incomparable sophistication of Audrey Hepburn at Breakfast at Tiffany's. New York, Time Square, the ball drop a kiss and who knows someone hands you a little something in that delightful blue box : ). Hey, it is time to dream with a delightful 2010! Happy new year to you all....health...love....and load of cards! Ps. 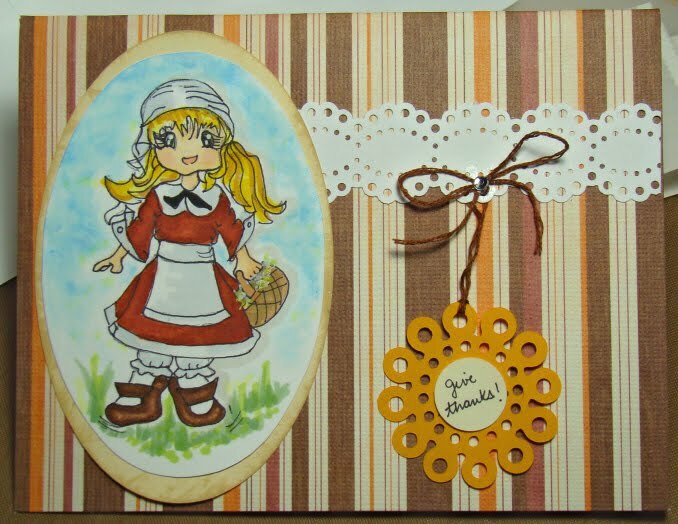 : I should also mention that I submitted this card to try for a spot at Cindy's DT.....; ). One of my wishes for 2010 came in a little early...tune in for the next post. Howdy folks! After spending almost two weeks sick….and under the influence of…..antibiotics (aha! Gotcha! )…I found some inspiration to make a card that probably was a wishful thinking for me! HAAH. Anyway…I prepared a couple cards to try for a spot at Cindy’s Design team….Here is one of the two I prepared…I will post this and that later. I made this one using a gate folding tech. I added a little something on the inside to frame the text. Yeah Baby! The groove is the heart! Oh my, I like that so much..I was this tiny big and I had so much fun dancing that. Hey better that some depressing songs that I have been coming across lately. To be quite honest, the music now a days is, lets say eh. Loops and garage band make anyone and everyone a musician...Not quite in my rumble ears opinion. Well..one thing I know. When you are in the groove and want to shake the skeletton a gooood DJ is a must and that my friends I know. I know Paty Rios forever (before she was Rios! )..this gal rocks and makes people dance thru the nite. I bet she did just that this week while celebrating her bday! So her it goes my dear friend...The Groove. The Gorgeous...Happy birthday! Oh I follow Saturday sketch Saturday design (I am putting my name in the bag)..I thought it was a pretty cute sketch. It is show time! Holiday season is right at the door step...so as the snow! Say hello to my Rock snow star. I better find a name for her (How about make a comment and drop some suggestions?)! I made this card based on the Friday Sketchers. I am not sure if I will be able to make, but my idea was to make something . Did I say I am a rookie? Yeap. I decided to do this card in the last minute while I was sleepless last night...( Now I am ready to hit the sac heheh). I am just loving to experiment with all kinds of goodies I have been collecting thru the past couple months. Yes, yes I used my beloved microbeads...they are so cool! Aside from that I also tried for the first time Ranged puff embossing powder...what a neat texture. I like it! But beyond micro beads my new obsession is MARKERS! The more I color the more I want to learn about markers and its techniques...I am in heaven with these pens! I will update the "This & That" later today. So good luck for all of us...TGIF!!! Update: I just decided to enter the Saturday challenge about Snow! Lights! Hanukkah the festival of lights honors a miracle. The supply of oil in the Temple was enough only to keep the Menorah lights for one day… but miraculously the lights burn for 8 days. When I think of this miracle…I cannot stop to think how that difficulty faced back then could be translated into today’s reality, where so many people has to “magically” makes things last. Faiths keep us alive! Now to the card! I am getting crazy about micro beads. I have to say that if you try to use micro beads you going to go nuts. BUT these tiny little balls look PRE-TTY! The texture given by these tiny beads is so cool; you surely will get a nice extra “humph” in your design. It is worth chasing them around : ). I highly recommend using a tray and also lots of fabric softer sheet to help with the static. In this card I also used for the first time my new Sizzix embossing folder. I like very much the tiny flowers. This new folder is a winner….perfect for Valentine’s Day and spring! Don’t you think? Do you have Sizzix folders? What is your favorite? ¤ Ink & stamps: none. We all know that in life, family and friends are the things that matter the most. I was lucky to have met my dear friend and “sis” Connie. She is a dear buddy in the embroidery +sewing world = everyday life. Connie and I bumped into each other over Craftster and we have exchanged items and helped organizing a couple swaps (it is so much fun!). We never stopped talking…a true friendship was granted thru craft! Well, like good girly gals we both moved almost at the same date this year…so I promised to make her “We’ve moved!” cards as part of her housewarming gift. Connie call her 8 (yes, eight and she is my hero and super mom) kids monkeys…so choosing a mascot to spread the word was easy! ¤ Markers & Pens: Copics E 21, E35, E51, E 58, E95, RV6, RV20, RV11; White Inkessential pen & Prismacolor premier. ¤ Ink & stamps: Brilliance pearlescent blue sky (Tsukineko); White opaque (Studio G): Chalk Brights (Inkadinkado); Monkey design by Anary (me! ), House stamp (inside) Free stamp by Susan Wherey (CraftStamper September 09). ¤ Embossing & Die cuts: Swiss dots (Cuttlebug), Rings (QuickutZ) embossing folders; Silhouette tag (from silhouette.com), Phrase, Hugs & Kisses (Sizzix) die cut. ¤ Tools: Square punch (Marvy Uchida); Scrapbook adhesives Ez runner.